Once Millennium Partners comes up with an approved design, a new tower will rise on the site of the former Winthrop Square garage. What’s it like to design a major building in Boston that everyone loves — from City Hall to neighbors to environmentalists to architecture buffs? Maybe one day we’ll find out. Until then, there’s the reality: It’s no small challenge to design something on a grand scale in Boston that’s both practical and pretty, that’s financially sensible and visually stunning. On the long, winding road to approval, it’s easy for bold design to turn dull, for an architectural exclamation point to become another glass box. 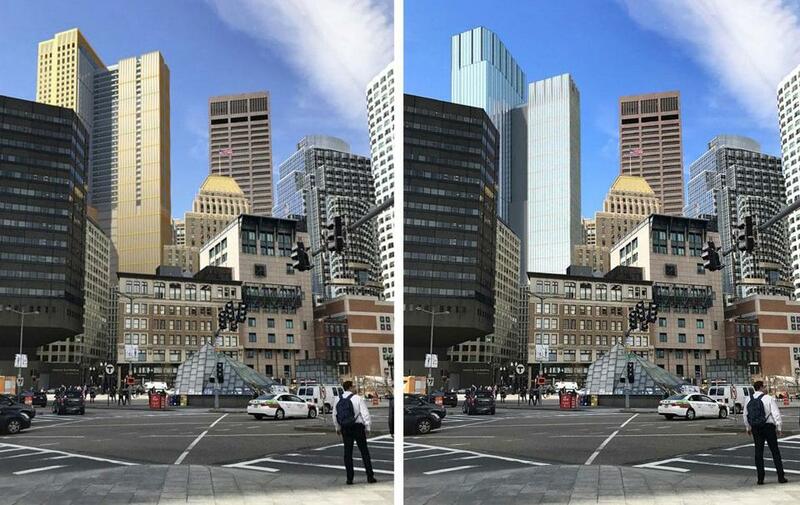 Take the case of the skyscraper planned for Winthrop Square. For more than two years, developer Millennium Partners and its architects have been crafting plans for a tower on the site of a now-demolished city-owned garage, trying to balance elegance worthy of a prime spot on the downtown skyline with the economics of a $1.3 billion construction project. Millennium recently unwrapped its latest plan for the building, a 690-foot T-shaped glass tower, filled with nearly 1.6 million square feet of space for what will be some of Boston’s priciest condos and office space. It’s the third version of the project Millennium has shown publicly. This one is shorter and blockier than the original, whose pleated front and spacious Grand Hall helped the company beat five other developers for the right to build on the city-owned site. But it’s sleeker than the second incarnation, which was widely panned. Still, following a nearly-two-hour conversation about the fine points of the design one evening in March, members of the Boston Civic Design Commission told Millennium and architect Blake Middleton of Handel Architects that they need to do better to earn the board’s blessing — one step in the building’s lengthy review by the Boston Planning & Development Agency. 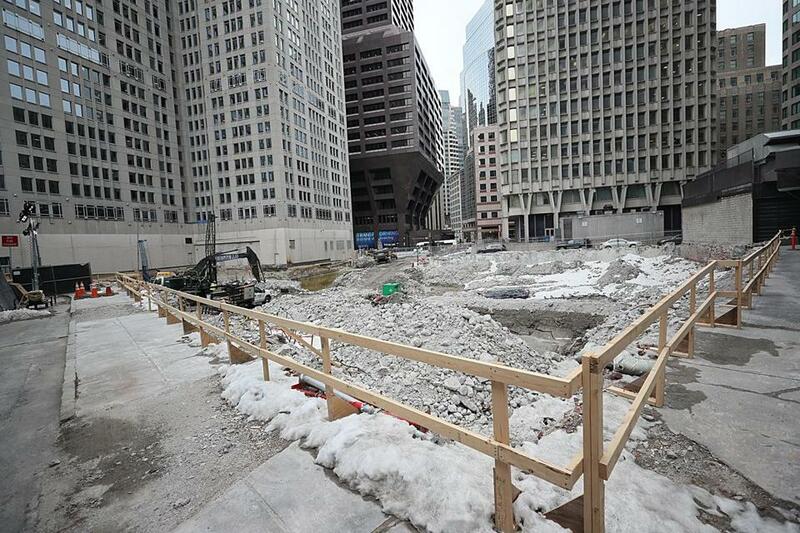 Winthrop Square is the latest, and highest-profile, example of a push and pull that has characterized much of Boston’s current building boom. As projects move through city permitting, developers must make tradeoffs and concessions to balance economics, aesthetics, and other needs. Too much focus on profits, critics say, breeds the sort of boxy sameness that marks much of the Seaport’s new architecture. Too little, developers say, and projects can’t get financed. Add to that neighborhood concerns and the requirements of city, state and — in Winthrop Square’s case — federal regulators. It’s one reason why, when it comes to large real estate projects in Boston, the finished project sometimes bears little resemblance to the original proposal. At 1000 Boylston — a Back Bay housing development approved last month by the BPDA — a plan for two towers, the taller one stretching 566 feet, eventually became a single 484-foot building, with one-third as many units. The downsizing came after neighbors complained that it was too massive and would cast long shadows across the Back Bay. Design details for the Hub on Causeway, a three-building complex next to North Station, have evolved several times since it was first proposed five years ago. The developer now is seeking permission to make an office tower 75 feet taller — though skinnier — to enable higher ceilings preferred by the tech companies that are flocking to the neighborhood. 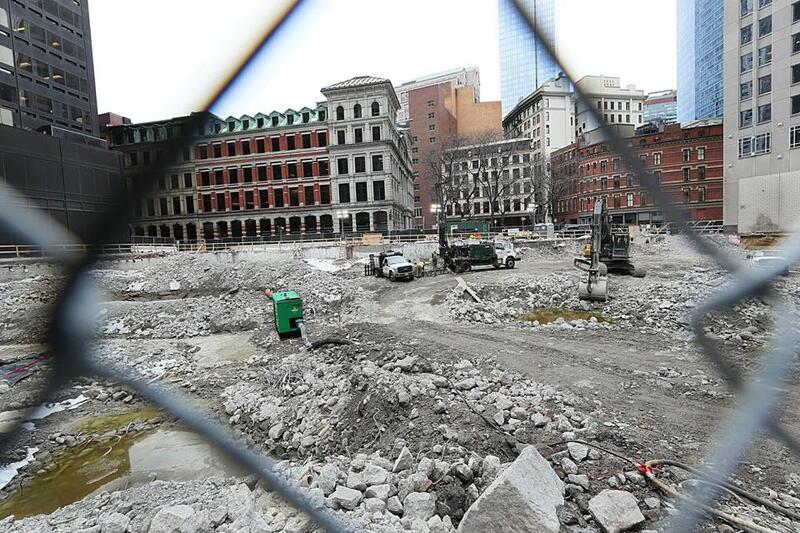 At Winthrop Square, there’s another complication: Millennium is buying the site from the city, and has agreed to pay as much as $166 million for it — money Mayor Martin J. Walsh has already earmarked for parks and public housing. The final price will be determined by the size of the building — Millennium will pay the city $100 for each square foot of condominium space it sells. That’s on top of aggressive city hiring requirements and mandated affordable housing payments — also tied to the building’s size — that will likely total tens of millions of dollars. To some degree, that means maximizing its square footage, which Millennium has tried to do even as the building has gotten shorter. In November 2016, it initially filed plans for “a thoughtfully designed, iconic tower” as tall as 775 feet — taller than the Prudential building — with a bright “solaria” of office space rising partway up the back of the building along Federal Street, and a public “Great Hall” at street level with cathedral-like arches soaring 60 feet high. It was to total 1.1 million to 1.5 million square feet of space. Then came a lengthy fight over shadows the tower would cast on Boston Common and the Public Garden — which Walsh argued were worth allowing in exchange for Millennium’s payment. Also, the Federal Aviation Administration ruled that any building above 710 feet in that part of town would interfere with planes taking off from Logan International Airport. In January, Millennium responded with a new design. The building proposed would be significantly shorter — 690 feet — and the cathedral ceilings of the Great Hall were replaced with a flat-roofed design that Larkin said would create more usable space. More strikingly, the clean vertical lines shown in the tower’s earlier design had been swapped out for a blockier front, and the mid-rise solaria now extended all the way up to the top floor, creating a huge T-shape that allowed for 1.6 million square feet of building space. For more than two years, developer Millennium Partners and its architects have been crafting plans for the site. The design commission was unimpressed, and the reviews from Bostonians who follow such things were swift and harsh. “It’s a disgrace,” wrote Boston resident Andrew Wiley, in a letter to the BPDA. “Boston deserves a much better-looking tower,” said Edward Hou. Several other writers called Millennium’s revisions “a bait and switch” — changing the original design for one that was less appealing. Steve Belkin, who owns a neighboring office building, said the city must do a better job balancing its role as seller of the site and regulator of what can be built on it. “This seems to have created a significant conflict of interest,” wrote Belkin, who said Millennium’s tower would dwarf his building and hurt his rents. Late last month, Middleton and Millennium came back to the BCDC with some changes. The strong vertical lines were back. Its top was sculpted instead of flat. The rear section — the bottom of the T — was set off more from the front, almost creating the appearance of two towers built into one. The square footage was down slightly, to 1.59 million. Middleton and Larkin and the architects and developers who sit on the BCDC gathered at a City Hall conference table, trying to hash out the specifics. Several commission members said the building felt overwhelming, too close to its neighbors to be so large, and too blocky for the skyline. Longtime Boston architect Bill Rawn urged an even greater distinction between the two parts of the tower. Middleton agreed to work on more changes, though Larkin later noted than any significant reductions in size would come with tradeoffs — including less money for affordable housing. Ultimately the final design — and the project as a whole — hinges on approval by the BPDA. Late Friday, the agency sent a letter to Millennium outlining specific changes — which Larkin said his architects have been working on since the BCDC meeting. A BPDA spokeswoman said a final board vote will be pushed to May instead of April as originally scheduled. As they weigh how hard to push Millennium, city officials need to balance the quality of the building and the size of the purchase price of the site, all without alienating neighbors, said George Thrush, an architecture professor at Northeastern University. It’s an exercise in politics as much as design. “The only real control here is politics,” he said. The hope is that the tug of war from competing interests will lead to a better building in the end, said Alex Krieger, a principal at architecture firm NBBJ. The trick for both the developer and the city, he said, is not to give too much. The developers replaced a widely panned design (left) with a new one to address a variety of concerns.